This morning has made the whole Our Digital Planet experience worthwhile for me. 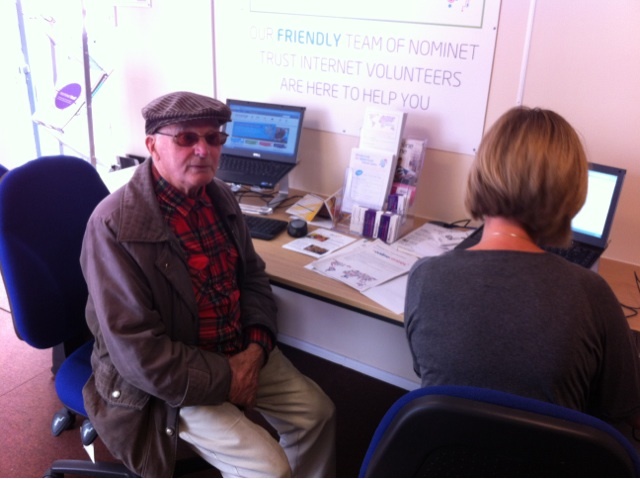 The first customer into the unit was Ron, who happily told us he was 84 and had no interest in the internet at all. But he was interested in photography, and had been looking at some of the photos in the exhibition. So, Rachael from Nominet Trust took him on a tour of the images. Ron came back into the Internet Station enthusing about the big image of old Bristol on the side of the unit, and reminiscing about the trams in Croydon where he used to live. So, Rachael showed him some online images of Croydon trams. Ron was pretty amazed about how easy it was to find such things, and, within minutes he was asking us to look for some pictures of himself dancing in a nightclub, which he had been told were on Facebook. We didn’t manage to find them. but we did find images of some of the places where he was due to go on holiday and trip advisor ratings for them, which he found fascinating. Ron’s a photographer and a painter, and, when he realised that he could upload photos and images of his paintings, he left bubbling with enthusiasm and promising to come back. This experience fills me with the kind of “Social Glow” that we experience from Social Media Surgeries. This entry was posted in Digital Inclusion, Social Media Surgeries. Bookmark the permalink. Fantastic! We meet Rons all the time, and agree, if you find out what interests a person you can soon get them wanting to go online. This is a far better approach than stupid lessons on microsoft word which is what is on offer by funded sources. When will the ‘powers that be’ start funding useful ways of getting people online instead of courses that can be measured and tick boxes? And, two hours later, Ron is back, wanting to watch Youtube videos of a film he was in 3 years ago. I reckon we have a convert!